Express your commitment and love for each other perfectly with this elegant 18ct white gold brides' 3mm flat court ring. A beautiful symbol to commemorate your special day. 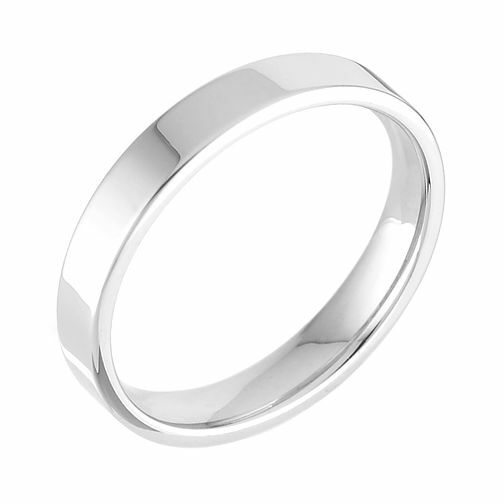 18ct white gold 3mm extra heavyweight flat ring is rated 3.5 out of 5 by 2. Rated 2 out of 5 by Anonymous from Poor Quality I chose the ring I wanted on line and went in to a store to see what it looked like. They didn't hold it in stock so I ordered it anyway. The ring arrived in the quoted time frame and although it was smaller than we thought it looked good. I put the ring on last Friday and today is Monday and it is covered in scratches. I have done nothing strenuous with it and take it off for anything that might damage it. One of the scratches occurred after taking a lid off a plastic bottle. Seems that the ring material is too soft and it won't be too long before it needs repair. Rated 5 out of 5 by Anonymous from Can't Wait to Wear My hubby to be has bought me this as my wedding band, I love it. He had got me a wedding set when we got engaged but I wanted something more traditional as my wedding band and when I seen this one and tried it on it was perfect. I cant wait to get this ring on my finger along with my amazing bling EJ engagement ring.